In this edition: Beware, The Ides of March and Progressive Talk Radio bids L.A. Goodbye. Bashir bashes and MSNBC backlashes. Berwyn!?!? The slow, loud fall of talk radio’s biggest d-bag. I recently wrote about the meteoric rise from local heroes to national TV for Paul Revere and The Raiders (and how the entertainment industry turned them from hopeful musicians to clowning TV “characters“). I also wrote about how The Box Tops were messed with and lost control of all their music and even their name. The Ides of March seem to be a different story–a garage band that was able to stay in control of their careers after having an early hit, “Vehicle.” True, they broke up and had a 17 year hiatus as songwriter and singer Jim Peterik went his own way, but they reunited and still play their hearts out with their unique blend of harmonies, horns, and soulfulness. It all started in Berwyn, a suburb west of Chicago’s downtown. Berwyn is working class with a heritage of thrifty Bohemians and Chicago-style bungalows. Berwyn’s main drag, Cermak Road, earned the nickname “The Bohemian Wall Street” due to the large number of savings and loans located there. In true rags-to-riches style the Ides went from their parents’ basements in the mid-60s to local club success to a national hit that gave them a chance to open for Joplin, Hendrix, Led Zeppelin, the Grateful Dead, and other powerhouse groups of the time. Many in Chicago fondly (and many not so fondly) remember a Berwyn public art piece called The Spindle. 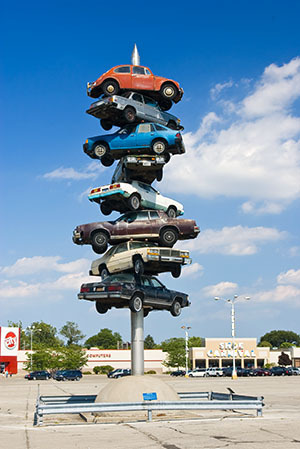 The Spindle was a sculpture created in 1989 by artist Dustin Shuler consisting of a 50 foot spike with eight cars impaled on it. The piece stood in a shopping center on Cermak Road and was demolished in 2008 when a drug store chain decided they would better use the space and the city could not find the $300,000 it would have taken to move it. I think that sounds a little steep for the task, but I’ll leave the accusation of corruption to the dozens of others that make it! Peterik also had a big hit with the band Survivor in “Eye of the Tiger.” He’s 63 and still rockin’ it, as a quick search on YouTube will show you. Now if you weren’t 63 and rockin’ it, and you were trying to take over a country with your ideas, wouldn’t it make sense to silence the voices that oppose you in order to reduce the amount of education disseminated in other views? If you are a totalitarian government, you take over the media and make it “state-run” and censor the content. If you are running the show outside of official rule you can still take over the media and censor the content. And you would call yourself Clear Channel Communications. In 2008, Clear Channel Communications was taken private in a leveraged buyout engineered by Mitt Romney’s Bain Capital and Thomas H Lee Partners, another Republican-loving private equity firm. Thanks to FCC deregulation, Clear Channel owns over 1,000 radio stations. Most of the nation’s 58 strongest, 50,000-watt AM radio stations are either owned or programmed by Clear Channel and the content they provide is the far-right rantings of Limbaugh and ilk. In something that clearly should be considered for anti-trust actions, the company owns both the stations and a talent syndication company called Premiere Radio Networks. Premiere syndicates Limbaugh, Hannity, Beck, Dr. Laura and others. They saturate markets with these shows and in small markets, provides shows like Limbaugh’s at no cost to the local station. The station benefits by not having to purchase or produce content in that slot, and the syndicate has committed to national ads that they play during the program. Clear Channel does have progressive radio offerings, but they tend to be on lower wattage “sticks.” Wherever Clear Channel owns a big AM radio station and other smaller ones, it always puts Premiere’s Hannity, Rush, et al on its biggest signal. This puts liberal stations at a big disadvantage in virtually all large markets — where the real radio money is. It should be noted that in recent months Clear Channel has been relegating Limbaugh’s show to some of their lower wattage stations. The consumer outcry over the Sandra Fluke comments proved too much for the public and advertisers and his advertising base has dropped precipitously. As of this week, it’s L.A. goodbye for Clear Channel owned progressive talk station KTLK at 1150am. In January it will be flipped to a far right-wing station format featuring hosts like Rush Limbaugh, Sean Hannity, Glenn Beck and renamed “The Patriot.” L.A. will have multiple right-wing talk format stations, several owned by the same corporation. Clear Channel is making similar changes in San Francisco, where Limbaugh will leave its KKSF-AM (910), and move to KNEW-AM (960) (in a downsizing move), and KNEW is being retooled for conservative audiences. The changes are set to take effect for the first broadcast of 2014. So well ahead of the 2014 elections, L.A. and San Francisco are both losing their progressive talk stations. It’s difficult to imagine that the makeup of these cities drives the format change–they are two very liberal locales. So we are only left with the idea that voices are being silenced. Other blue cities have lost their lefty talk shows, including Seattle, Portland Oregon, and Detroit though in those cases the stations had low ratings. Martin Bashir resigned from MSNBC after going too far dissing Sarah Palin. His utter contempt for her was evident and most would admit he went too far. But it was quite a Palin-stomping and in its own way, fun for lefties. Maybe Martin Bashir’s rant is enough of a high note to end on, but I feel I should amplify. We are, regrettably, unable to cheer up by making a new Spindle featuring the sweaty carcass of a certain talk radio host and his co-conspirators. However, we may take some solace in knowing that Clear Channel Communications operated at a $424 million loss in 2012 (and around $200 million loss in 2011). Certainly some of this is related to the industry–consumers no longer have to sit in their cars to hear the opinions of blowhards–they can use smart phones or their work computers. But some of it must be related to the unwanted purging of advertising dollars Rush brought upon himself with his hubris in attacking a college-age woman in truly depraved fashion. Limbaugh’s attack on Sandra Fluke was the “Ewww Ick” moment of the century to date. I’m not sure how much money Clear Channel will be willing to lose. Maybe in the living rooms of Bain or Lee Partners partners they can just take a couple hundred mil out of a humidor or something and give it to a footman or butler to bank.